If the majority of your visitors aren’t yet ready to buy, what do you do? Let them disappear never to return again? That’s what a lot of unknowing (or unmotivated) websites do, but it doesn’t make sense. The first visit to your site is often just the start. You need implement strategies to stay in touch with those visitors in-market and who are considering your product as a potential for solving their big problems. After all, if only 3% – 8% of your visitors are ready to buy right now (it does vary), a portion of them will be ready to buy over the next few months. Which means you can easily increase your sales, simply by developing a strategy of staying in touch over time. If you think of sales as developing a relationship vs. completing a transaction, you start to see the bigger picture. There are many ways of connecting with your potential customer, through multiple channels, as you’ve experienced in your own online journey. Maybe you’re connecting with me right now? Let’s consider the numbers: Cahners Business Information analysed 40,000 inquiries and found that 47% of people took a year or more to purchase. If that sounds like a long time, don’t let that discourage you; they also found the other 53% bought within 3-12 months. No, I don’t mean inappropriately, but I do mean multiple avenues of reaching your prospect – email, re-targeting, social media and a content strategy that allows you to target buyers throughout their buying journey. Marketing 101 tells you that your visitor needs to see you 7-12 times before they’re interested in doing business with you. A good starting point for thinking about this strategy is the ‘Rule of Seven,’ developed by marketing specialist Dr. Jeffrey Lant. Lant highlights that in order to penetrate the buyer’s consciousness and make significant penetration in a given market, you have to connect with the prospect a minimum of seven times within an 18-month period. That may sound like a lot to you, but it’s well-documented – and long-known – to be the truth. A newspaper ad from the 1870s says your customer doesn’t even notice your ad the first time they see it. The 2nd or 3rd time, they’ve acknowledged it somewhere in the brain’s periphery. By the 6th time, they’re considering buying it. In today’s world, there are so many more ways than newspaper ads for you to reach your target customer. If you don’t use them, you’re leaving money on the table, plain and simple – and stupid. Fortunately, with today’s technology, you can incorporate buyer’s guides and ebooks, deals for those who’ve abandoned their carts, and many other re-targeting strategies, to stay in front of your prospects. Just remember though, your aim is not to re-target everyone, only re-target those that have shown proven intent to buy or engage with your business – that’s where many get it wrong. If you decide to go on a trip to Phuket, do you make the decision, buy the ticket, and get on the plane on the same day? Hell no. You think about it, you explore your options, you consider how long you’ll stay there and what you’ll do, you set up fare alerts – heck, you might even consult with a travel agent. Take this example; In my family, my wife typically does the travel bookings and I asked her how many times she visits a hotel website before booking direct. She highlighted that it was likely 3-4 times before actually making the booking, this might span multiple weeks. It’s no different when your visitors first land on your website, their first visit is potentially only the start of the journey and it’s up to you to create the additional touch points to ensure they build trust and become aware of all you can offer to them. Marketing Automation is the industry buzz word at the moment. You might have heard it? What it will help you do is get the 2nd, 3rd or subsequent “touches” to complete the customers buying journey. Due to an initial need, targeted prospect lands on your website, where you have a well defined headline that grabs their attention quickly and shows, right away, how you can solve their problem. “We turn under-performing digital marketing campaigns into thriving high achievers” Pretty much sums it up, right? But other websites might have that, too. 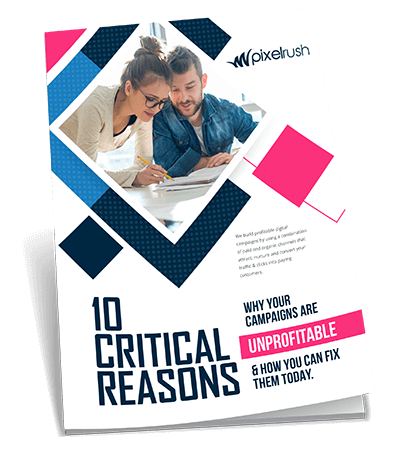 So you then offer a guide (an ebook) that walks them through your process of finding more customers – “10 ways to maximise digital marketing profits and reduce wasted spend”. They sign up, so they can get the free guide. Perfect – they’re in the door. Now, you have the opportunity to nurture them through the process of becoming a customer by showcasing your experience and offering them a tonne of value upfront. You take action, to keep the door open. This process isn’t easy for a new comer, either you’ll need a lot of trial and error or you’ll need to hire someone with the experience to help. They know they have a problem, and now they know your company exists and once they have opted in you now have a direct connection to their inbox. Use buyer’s Guides, eBooks, maybe even a video series which empowers them with the knowledge to make better buying decisions – all of these encourage potential customers to feel confident in a relationship with your business while building brand awareness and trust. You know why your product / service is superior now it’s up to you to empower them to see it for themselves. Secondly, you want to show them that you understand the big issues and pain points they have right now. Show the ways to solve their pain points using the products and services you can provide to them. If you market to everyone then you’ll market to no one, define your buying personas so you can speak directly to your ideal prospects. As you get deep within the nurturing you then offer case studies or white papers. These help your prospect favourably compare your company to others. After all, comparison is a natural part of decision-making, so be the business that makes it easy for them to compare. Most marketing automation systems have a scoring system which helps highlight to you when your prospect shows signs of buyer intent, like visiting the checkout or abandoning their cart. When you see such signs, send follow-up messages, like discounts or “how can we help” emails which have a more personalised touch. For those that don’t take immediate action then you can continue to follow up with engaging and valuable email content that can help to improve your relationship and trust, besides you already know now that up to 47% can take a year or more to buy. Every time your prospect has the opportunity to interact with you, it’s another “touch” on the way to a sale. Keep offering opportunities. There are so many ways to influence your visitor’s buying decisions these days. From design, to copy, to fast-loading websites, to social media and beyond – and all of them are important. Yet, when it comes to increasing your sales over time from your existing web traffic, don’t overlook the importance of lead nurturing, through options, retargeting, and paying attention to buying signals. The bottom line is that “companies that excel at lead nurturing generate 50% more sales-ready leads at a 33% lower cost.” (Marketo) More customers and less spending? Sounds like a no-brainer here. Instead of taking the lazy approach, and wondering why your competition is seeing better esults, get to work on increasing touch points across all of your visible platforms.